Another humid Manila day. Where you are unsure to wear sandals because of the impending rain, but stubborn enough to be sensible. After hopping off a cab on Pedro Gil, I was scheduled to meet my dad on Padre Faura a little after noon. For some reason to get across a road nowadays, you are confronted with a shopping centre to break on through to the other side. No pun intended. As I walked the old streets of Manila, I felt a sense of confusion come over me, leave alone what the other locals and tourists thought. The chaos of pedestrians, cars and jeepney’s is bewildering. The mounds of earth, potholes and decaying buildings. For years Malate, was known as the abode of writers, artists, photographers and musicians. Historical sites replaced by yet another condominium. Your last restaurant haunt -now a concrete parking lot. You’re left with faded memories of glory. Depressing as it may sound -the standard landmark we chose to meet at was the nearest McDonalds before the final point of destination. Dad got in early, I saw him standing inside the packed Golden Arches taking a break from the unforgiving heat. It was full of people in their early 20s, on a Monday. Do people work in Manila? It is one of the only cities in Asia that has managed to produce a generation obsessed with fast food. Has the local colour worn off? Culture? No sense of national pride? Or is there literally nothing left? Just a few meters away from the burger chain, we walked to La Solidaridad, A quaint book store, established in 1964 by acclaimed writer and National Artist F. Sionil José. A time when clinical retailers were nonexistent, where stand alone shops thrived. From the moment you open the door, the smell of books, old and new were intoxicating. La Solidaridad is Spanish for “The Solidarity”, an organization that was created by Filipino liberals exiled in Spain towards the end of the 19th century. They issued their own newspaper, which published articles and essays on the cultural, political and social conditions of the Philippines. F Sionil José chose the name well, his articles about the lack of patriotism in the Philippines, and how essential it is to remember your roots, still echo the same rants of the past. F Sionil José was born in 1924 and of Ilocano descent. His family were extremely poor and migrated to Rosales Pangasinan to start a new life. His mother worked hard to provide for her family and purchased books for her son Sionil with what limited resources they had. He loved to read and began to write at the tender age of 11. The trials he went through as a child, deeply affected his art. He studied at the University of the Santo Tomas but dropped out and broke into Journalism and writing after World War II. He mainly writes in English-with a number of works translated to over 20 different languages; and distributed around the world. Throughout his career F Sionil José ‘s novels and essays are reflections of the injustices and class struggles faced by the Philippines as a colonized nation. We were early for our appointment. A valid excuse to wander through the store. There was a vast selection of Filipiniana, the Classics, novels and travelogues. The man has good taste. It had been a long running bet or should I say joke with my dad if we’d be able to meet the old man before he’d kick the bucket. But then who’s to say if either one of us would be taken by the good Lord first! We had called in the office a few weeks before and I suppose they assumed we had some business to talk over with. They were quite surprised that our intention was to meet Manong Frankie in person. The years of reading his literature and regular column in print, was not enough to express our admiration. We were summoned to the 2nd floor and were introduced to Mrs. Jose, while their secretary fumbled over a stack of papers. The files and books almost reached the already low ceiling. Hardly a computer in sight, it was quite refreshing. Time had stood still in the 60s. Mrs. Jose wrapped herself into a light shawl, and escorted us up another flight of stairs. It was a well lit building, with wooden floor panelling. 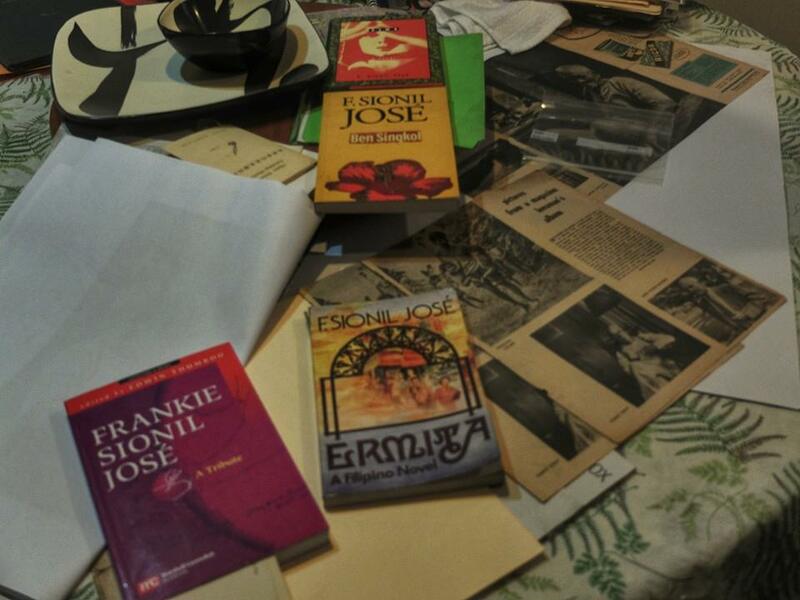 As we reached the room, a round table filled with books in different languages, mainly translations of José’s novels through the years. His wife was a soft spoken lady, petite, almost fragile to a point. Opposites do attract! She knocked on a large door, as we waited in bated breath behind her. F Sionil José has a presence. Not just his writing and strong opinions. Was it the loud shirt? His large frame? Or was it the way he wore that little hat? All geniuses have their eccentricities. He stood up to greet us, and we introduced ourselves. It is a bit intimidating to meet someone of such great stature. “Please sit down, what can I do for you?” he said in a deep voice. My father and I explained that we had wanted to spend the afternoon with him and talk about his work, past experiences and the writers he had met in his lifetime. At the age of 89, he has lived around the world and met quite a few characters. Which made for colourful yarns. He showed us how he still wrote everything on paper. A novel, a column. It didn’t matter. All by hand. In the age of computers and hand held devices, we take for granted the value of a pen and paper. No plugs needed. It is instantaneous, as you hear it in your head; you are able to write down your thoughts into words. A very personal process. In my case- script that only I can decipher! He flipped through the bound book, with crisp unlined pages. It was full of his scribbles; my eye did not know where to begin. I told him the story of my first experience of reading his novel “Ermita”. At 15, a Protestant in a Catholic all girls’ school, with an “explicit” book in hand- did not go down well with the Nuns. He laughed hysterically. Eventually at the time teachers could get expelled for putting it on the reading list. I of course was put on probation. The moment Mr. José, forgot a date, name or fact in history, he would pick up the phone and dial his assistant. Dad tried to help. He needed someone to remember. Age was catching up. But he was embracing it. I noticed the fondest memories he had of Manila stopped at the end of the 50s. The Philippines was on top, back in the twilight zone. Something none of us can recapture, leave alone experience. The years after the glory days, were spent writing of how this country could be great again. 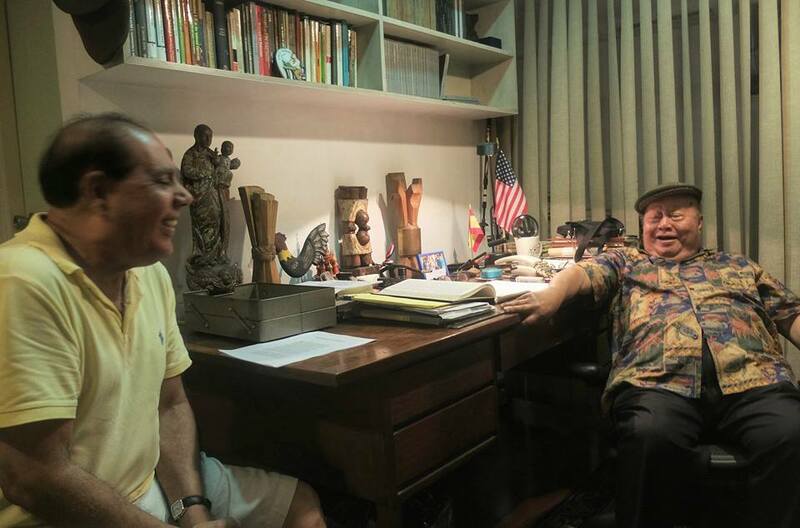 F Sionil José’s building and works are living proof – he is from a generation that is soon dying out. No individual from our side has the same creativity or conviction. 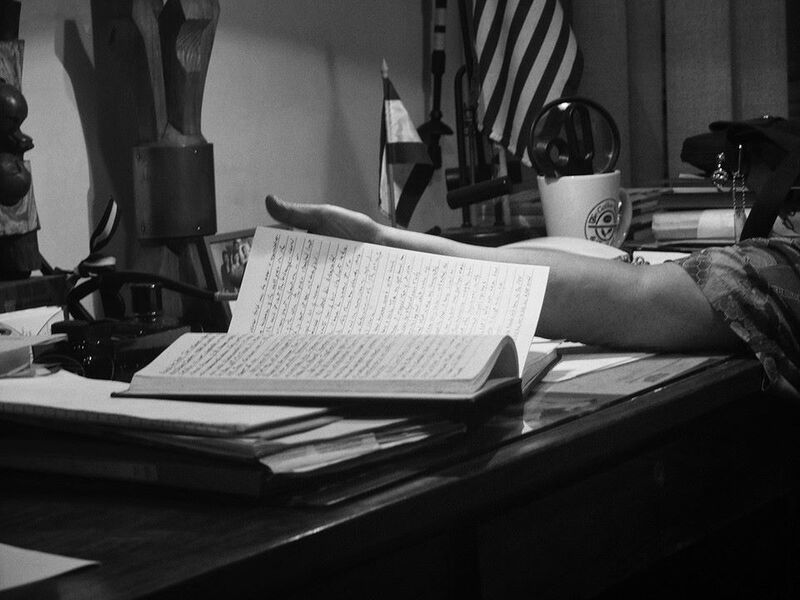 We knew he still had a lot of writing to do, but at his age, the man deserved an afternoon nap. We stood up to leave, and did not want to further impose. Hats off, my father and I were not disappointed. He took us strangers in. An afternoon well spent.